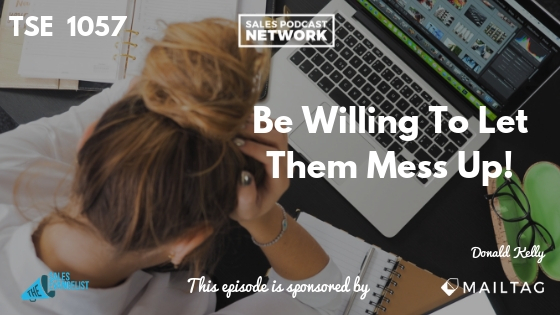 Home » TSE Podcast Post Page » TSE 1057: Be Willing To Let Them Mess Up! Sometimes business leaders find themselves wanting to make sure that their team members get everything exactly right, but unless you’re willing to let them mess up, they’ll likely never learn. Perfect situations don’t exist. Imperfection is a factor in life, but it’s also where our growth happens. Control often gives us the sense that we can force everything to work. As a result, we avoid letting our team members try things their own way because we fool ourselves into believing that our way is always the best. In my own story, I landed an appointment with a huge organization, and I invited the CEO of my small company to go along. I wanted his support, but I also wanted to show my boss that I was working hard. I wanted him to see the opportunity I had landed. Most importantly, I wanted him to support me through the unknown parts of the appointment. If I found myself struggling in the conversation, I knew he could help me out. Turns out he took over the whole show. Instead of acting as a ride-along on my appointment, I was the tag-along. I had been talking to the client for months, so he felt a little bit ambushed. I had promised him one thing and then given him something completely different. Instead of a meeting with a sales rep, he found himself sitting in a meeting with an executive that he wasn’t really prepared for. I imagined myself leading off the meeting and asking for his input along the way. I didn’t imagine it becoming his return to the glory days. Because I wasn’t operating from a playbook, there was no real structure. The deal did close, but it was challenging. If you find yourself asking why it’s a big deal, the problem was that it eroded my confidence as a seller. Sometimes, because CEOs and entrepreneurs started out selling their own product or service, they have a tough time letting that go. They see a problem and they address it themselves because it’s how they operated before they hired sellers. My CEO misunderstood my request for help and he took over the meeting instead. 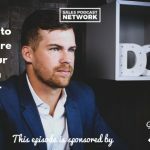 In a previous episode, Kevin Davis talked to us about the challenges that sales managers often face, and the book he wrote, The Sales Manager’s Guide to Greatness, that addresses many of those issues. When I finally had the opportunity to go on meetings myself, I fell into a habit of mimicking what I had seen my CEO do. I shared the same stories, even though they weren’t my own stories, but I hadn’t gained an understanding of the problem I was trying to address. Because there wasn’t any substance to my conversations, my opportunities started falling away. I wasn’t having a problem keeping things in my pipeline, but I was struggling to get them to close. The old adage of the butterfly struggling to get out of the cocoon applies here: the struggle makes the butterfly stronger. If you were to cut open the cocoon so he could easily slip out, he would never develop strong wings that would help him fly. You’ll never set the vision for your company moving forward if you’re busy doing the work that you hired your sales team to do. We should have developed a gameplan before going into the meeting. By deciding who would say what and how we would build rapport, we could have avoided the awkward meeting with the client. My CEO could have reviewed the questions I was planning to ask to ensure that I was properly prepared. Then, he could have assured me that if I got into trouble, he’d be there to help. That scenario would have allowed me to at least try running the meeting. The sooner you prepare your sales team to operate on their own, the more room you’ll have to grow your company. Coaching is the correct answer. As you grow a more experienced sales team, you can add to is, and you can create repeatable success. You will have to let them mess up. That doesn’t mean you ignore any train wrecks that are happening, but you can help them understand where they went wrong so they won’t make the mistake again. Specify roles and responsibilities before the meetings so your team will learn to fly on their own. Sometimes, in the role of coach, it’s tempting to give your team members the correct answers so they’ll learn more quickly. Don’t do it. Helicopter managers tend to erode the team’s confidence and they actually lengthen the learning process by creating people who rely heavily on their help. When they discover the answers on their own, the learning will be more meaningful. Send us your stories about helicopter managers so we can all learn from the experience.